Bay Shore Hotel was a popular attraction for African-Americans from 1898-1973. Giving new life usually is reserved for Thomas Nelson’s EMS and nursing students. However, in Cece Wheeler’s Digital Video certificate program, four students are giving new life to the famed Bay Shore Hotel in a 20-minute documentary that was shown Feb. 13 in conjunction with the College’s Black History Month celebration. The hotel opened in 1898 as a four-room cottage for African-Americans. 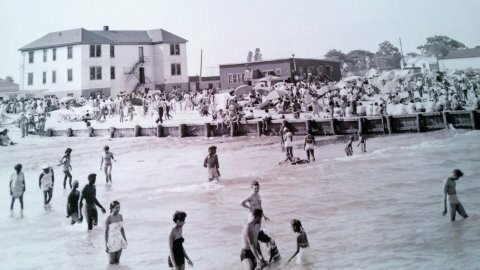 It was on about six acres, with 100 yards of beachfront, adjacent to Buckroe Beach, which was for whites only. By the late 1920s, it had grown to a 70-room hotel with a dance pavilion, restaurant and conference rooms. The area also included a private beach, boardwalk, fishing pier and a roller coaster. After being destroyed by a hurricane in 1933, the hotel was rebuilt and continued as one of the main entertainment and vacation destinations on the East Coast for African-Americans into the 1960s. The hotel eventually closed in 1973, about two decades after desegregation eliminated the need for separate beaches and hotels for blacks and whites. But in its 75-year existence, the Bay Shore was the site of national conferences, sporting events and concerts, and attracted big-name entertainers including Louis Armstrong, Cab Calloway, Duke Ellington and Ella Fitzgerald. “They just really dug deep into it,” Wheeler said. Since it was a student project, she thought it fit perfectly with Black History Month. The event included a panel discussion featuring the students who developed the project and some of the people they interviewed. Moore hopes people who see the film develop an appreciation for Bay Shore and its historical significance. She admitted, even with a 20-minute presentation, the documentary gives just a taste of what it was like. There are many more stories to tell.